Lucideon has developed a new infection control method to tackle problems associated with digital technology in hospitals. 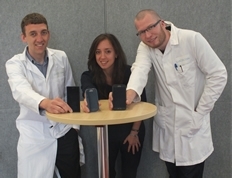 Scientists at the company have collaborated with Dr Paul Royall and Avneet Uppal at the Institute of Pharmaceutical Sciences at King's College London to develop an antimicrobial coating for portable communication devices. The technology has been developed to cut the risk of cross infection from tablet devices and smart phones, which are increasingly being used by healthcare professionals in the workplace. It provides a crack-free and transparent antimicrobial coating that offers excellent adhesion to the glass surface of handheld devices. Gemma Budd, Lucideon’s Business Manager for Healthcare, said: “Often people don’t think about the cross infection issues of mobile devices, but it’s a cause of considerable concern. “It’s a really exciting development, which could have a profound effect on the control and management of hospital-acquired infections. “We are focused on solving the issue of increased infections and antibiotic resistance – and this project marks a significant step towards achieving that goal. The technology developed is based on Lucideon’s inorganic controlled release platform. This is the latest in a series of innovations from Lucideon within the healthcare market. Lucideon is currently mid-way through a ground-breaking project, ReBioStent, which involves them co-ordinating an initiative to develop new biomaterials and arterial stents. The project is supported by over 5 million Euros from the European Union. Other projects being developed for the healthcare industry include Lucideon’s inorganic controlled release technologies for abuse deterrent drug delivery, to solve the rising global epidemic of prescription drug abuse. Novel biomaterials, including toughened ceramics and ceramic:polymer hybrids, are also being developed for bone repair/replacements, some of which are only possible due to Lucideon’s pioneering application of Field Enhanced Processing technology. A leading provider of materials development, testing and assurance, Lucideon - which has its headquarters in Stoke-on-Trent - was originally borne out of the British Ceramics Research Association. Led by Chief Executive Tony Kinsella, the company is enjoying major growth and is on track to increase its workforce by over 50 per cent over the next three years. It also recently announced it is opening up a new facility at the world-renowned Cambridge Science Park, as well as a new facility in North Carolina to tap into the region’s acclaimed expertise in materials science, and have better access to USA markets. The new centre in the US is in addition to Lucideon’s facilities in South Carolina and New York State.